Joynt began learning the art of Moo Duk Kwon Tang Soo Do. Jiu Jitsu to Kitsune Ryu in 1988.
age of 18. In 1986, due to Sensei Studebaker having to work for an extended amount of time out of town, Sensei Yamashita awarded Joseph his Shodan at the young age of 16. Joseph was granted permission to teach and promote students by Hanshi Yamashita. Years later, this became the common place, the minimum age for Shodan has since changed to the age of 16.
from Hanshi Yamashita. In March of 2015, Joseph was promoted to his current rank of 7 th Dan and awarded the title of Kyoshi by Hanshi Yamashita. Kyoshi Joynt has made it a point not to forget where he came from and contributes his knowledge and abilities to the many martial arts instructors to whom he has met and trained with over the years. Kyoshi Joynt owes a great deal of gratitude to now, 9 th Dan, Hanshi Don Studebaker. Without Hanshi Studebaker, Kyoshi Joynt would not be where he is today. 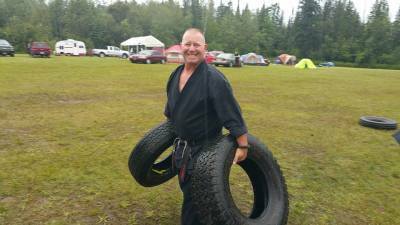 Kyoshi Joynt has recently had the opportunity to come full circle and take over ownership of the Posseyville Road Dojo where he began his journey in 1976. Kyoshi Joynt has named the Dojo “The Midland Martial Arts Academy” in honor of the Dojo that Hanshi Don Studebaker began many years ago.Kyoshi Joynt hopes to pass on the knowledge he has learned over the years to future generations to follow. Kyoshi Joynt also hopes to keep the legacy alive by one day passing the Dojo over to his son, TJ Joynt, who currently is also an instructor in the art of Kobayshi Shorin-Ryu Karate Do. Shihan Michael Maier began training in Kobayashi Shorin-Ryu Karate Do during the summer of 1989 under the direction of then, Sensei Joseph Joynt. During this time Shihan Maier was a professional high diver at Canada’s Wonderland during the summer months. Shihan Maier would train one on one with Sensei Joynt during the fall and winter. In 2000, Shihan Maier was awarded his Shodan. During his many years of training, Shihan Maier has competed in multiple tournaments earning many trophies. Shihan Maier has remained a loyal student to now, Kyoshi Joseph Joynt. Shihan Maier has assisted Kyoshi Joynt throughout the years teaching students at multiple schools throughout the United States and Canada. Currently, Shihan Maier has obtained the rank of 5th Dan and was awarded the title Shihan by Sensei Yamashita in October of 2018. Shihan Maier will be the lead instructor under Kyoshi Joynt at The Midland Martial Arts Academy. Sensei Theodore (TJ) Joynt , son of Kyoshi Joseph Joynt. Sensei TJ, as the students call him, has been training in the art of Kobayashi Shorin-Ryu Karate Do ever since he could walk. However, Sensei TJ did not begin his formal training until the age of 14. Throughout his martial arts training, Sensei TJ has had the honor to be directly instructed by many high ranking reputable martial arts instructors. Sensei TJ is an avid soccer player and a talented goalie in hockey. Sensei TJ has earned multiple grand championship trophies in martial arts competitions throughout Michigan. In 2016, Sensei TJ was awarded his Shodan by Hanshi Tadashi Yamashita. In 2018, Sensei TJ was awarded his current rank of Ni-Dan by Hanshi Yamashita. Sensei TJ is highly looked upon as a roll model and a mentor by the younger students. He has patience and a quiet way about him while he teaches. Many students can be heard stating that they would like to be just like him. Sensei TJ will be one of the Primary Instructors at The Midland Martial Arts Academy.